Dyna-System Series surge protector products provide the most effective protection available in the SPD industry. The Dyna-System series units, which include the DS20, DS30, and DS40, utilize a multi-stage series hybrid design to provide superior surge protection and EMI/RFI filtering. The Wagon Wheel(tm) module, which is the main component in the hybrid design, utilizes a circuit consisting of a circular array of metal oxide varistors in conjunction with fast acting silicon avalanche diodes to provide speed, strength and low let-through voltages. Dyna-System Series products feature chokes and in-line inductors and provide repetitive surge current protection from 150kA to 300kA per phase and up to 450kA on single impulse. All modes (L-G, L-L, L-N, and N-G) of protection are included. Redundant status indicator lights ensure easy and accurate monitoring. 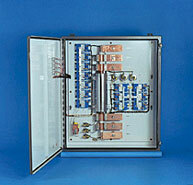 The Dyna-System series units provide the ultimate in surge protection. LEA International, Inc., 6520 Harney Rd., Tampa, FL 33610. Tel: 813-621-1324; Fax: 813-621-8980.